A new body scanning device has online retailers hopeful that this will be a profitable holiday season. Experts estimate that from 30-60% of all online apparel purchases are returned because they do not fit - and many shoppers don't even bother trying to order clothes online. The company already has in-store scanners that use the motion sensors from Microsoft's Kinect gaming device in Bloomingdale's in the US, Selfridges and New Look in Britain, and Karstadt in Germany. With the new system, a shopper inputs his or her height as a reference and can then take a single full-length picture with a webcam or smartphone from which all their other measurements are calculated. 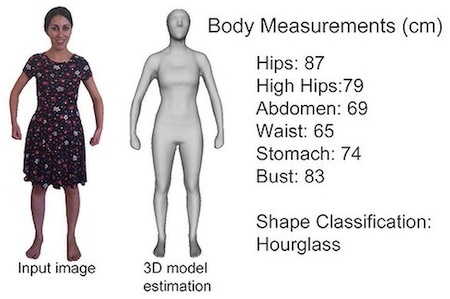 It uses the measurements combined with a person's overall proportions to build a 3D image. Combining this with sizing information from retailers, the system would also overcome the problem of variable sizing, which can mean a shopper is a "medium" in one store but a "large" in another. The technology builds on previous work by the University of Surrey that was used to create animated characters in games such as The Sims. I was also fascinated by the reference to The Sims, a product that was at least partly inspired by the kingdom in a box from the work of sf great Stanislaw Lem.